Saving Based Asset Pricing Models. Doktorarbeit von Johannes Kabderian Dreyer, Verlag Dr. Kovač 2012, 206 S.
Although the Consumption Based Asset Pricing Model (1) (CCAPM) is appealing not least thanks to its simplicity, its empirical test results are poor. If linearized, the model gives support to two of the most studied problems in financial theory: the Risk Free Rate Puzzle (2) and the Equity Premium Puzzle (3), meaning that the return of the market corrected by the risk is disproportionally high compared to the risk free rate return. The main objective of this book is to deal with these two puzzles. The basic idea applied is that asset prices are not only influenced by the investor’s consumption, but also by the variation of their wealth/savings. A number of nonlinear models are built and tested against US data, most of them considering wealth part of the investor’s utility function. While the idea of wealth/saving based utility functions is not new, this book offers novel ways of bringing the concept of wealth into asset pricing models: in some models human capital proxied by people’s level of education, is successfully included in the concept of wealth. In other models only asset wealth is considered. Because of the high correlation between variables, some of the estimations of the models were challenging and remedies for multicollinearity had to be used. 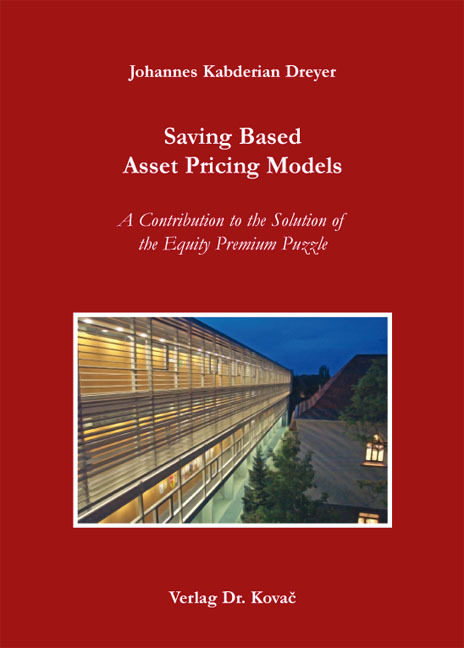 However test results are overall promising, indicating that the inclusion of the concept of wealth/savings in asset pricing models may indeed help solve The Equity Premium Puzzle and The Risk Free Rate Puzzle. (1) Rubinstein (1976), ’The Valuation of Uncertain Income Streams and the Price of Option’, Bell Journal of Economics, Vol. 7, 407–425. Lucas (1978), ’Asset Prices in an Exchange Economy’, Econometrica, Vol. 46, 1429–1446. Breeden (1979), ’An intertemporal asset pricing model with stochastic consumption and investment opportunities’, Journal of Financial Economics, vol. 7, No 3, 265–296.